Uneeda Doll Company Inc. made the Dollikin dolls from 1958-1980s. Dollikin's began as 19-20" fashion dolls - the world's most posable doll. Marked UNEEDA 2S (sometimes mis-read as Uneeda 25 or Uneeda 28), they had rooted hair in various colors and several styles, sleep eyes and most amazing - sixteen joints to pose her, just like a human (well a young one at least). The doll had a wardrobe as usual, that resembled the current fashions. Note; There are Uneeda 2S marked dolls that used the same dollikin heads, but do not have the sixteen multi-joints, just (six) the neck, shoulder, waist and hip joints. These dolls are "dollikin like", high heel fashion dolls, but do not command a price anywhere near that of the true multi-jointed Dollikin dolls. 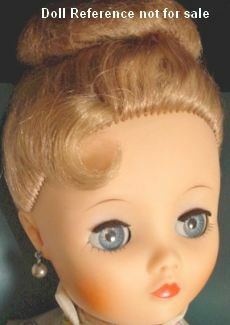 1958-1962 Uneeda Dollikin doll, 19-20" tall, hard plastic body, vinyl head with rooted hair, bubble cut hair style; brunette, red or blonde, ponytail, some with a widows peak, some in an up do bun that when let down is long and curly hair, short pageboy with bangs, sleep eyes in several different colors, usually in blue, real upper lashes, ballerina's often have additional heavier painted outer lower lashes, slim lady body with high heel feet, 16 joints - neck, shoulders, upper arms, elbows, wrists, waist, hips, knees and ankles. Some of the outfits were Lotus Blossom; a white satin pants outfit with fan print tunic, oriental outfit, brown or red plaid pants outfit or black velvet pants and white blouse, several different ballerina tutu's, a few formals have been found and a two piece skirt suit, but their could be others too. Doll marked UNEEDA 2S on head. ca. 1958 Uneeda Dollikin doll, 14" tall, called The Squirt by doll collectors, with 14 joints; at the neck, shoulders, elbows, wrists, waist, hips, knees and ankles. She just lacks the top upper arm joint of the larger doll. This one is quite rare and doesn't surface very often and we have never found one mint in box like the one above. Dressed in a white long sleeve blouse with a lace ruffled jabot and rhinestone accent, lace at sleeve ends, red grosgrain ribbon necktie and hair bow, black velvet pants donut snap closure with ankle revealing slits, drop pearl earrings, black elastic strap plastic high heel shoes. We have found at least three dolls all with rooted ponytail hair styles; brunette or blonde, but there may be other hairstyles, as well. Doll marked on neck © Uneeda. 1958-1959 Uneeda Baby Dollikin doll, 22" tall, hard plastic body, vinyl head with rooted hair in various colors, also has a multi jointed body. Unsure if doll shown is in original clothing. 1962 Uneeda Miss Twist doll, 19-20" tall, variation of the Dollikin same doll and markings, 16 joints - neck, shoulders, upper arms, elbows, wrists, waist, hips, knees and ankles. Had rooted short hair with bangs like the Mommy doll and wore a short sleeveless flapper dress with fringe. Doll marked UNEEDA 2S. 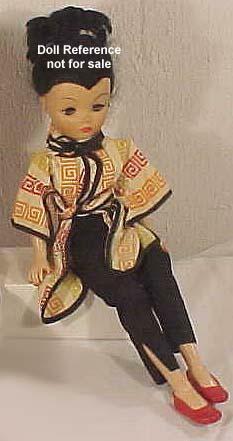 1962 Miss Twist doll, 19"
1969-1970s Uneeda Dollikin doll, 11 1/2" tall, was marketed as either a Fashion Dollikin or Action Dollikin. This was obviously meant to compete with (Barbie, Tammy, Tressy, etc. ) 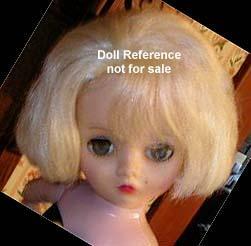 other 11 1/2" doll market. Came as a dressed doll with rooted hair, painted eyes and lashes, and 14 joints to pose her, and fashions available were of the current style. 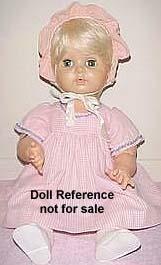 Marked; Dollikin ® US Pat 3010253 Other US & For Pat Pend, Uneeda Doll Co Inc, MCMLXIX Made In Hong Hong. 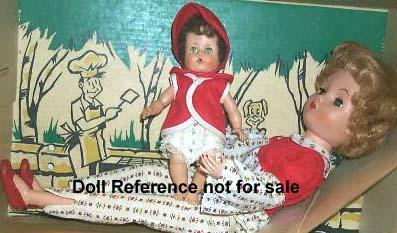 These dolls are easily found and have little value compared to their larger and earlier counterpart. 1969 Action Dollikin, 11 1/2"
1980s Little Miss Dollikin, 6 1/2" tall, Fashion Doll with 10 movable joints! - and is a dressed doll, usually in a jumpsuit of some sort, or two piece pant suit; shirt and pants. 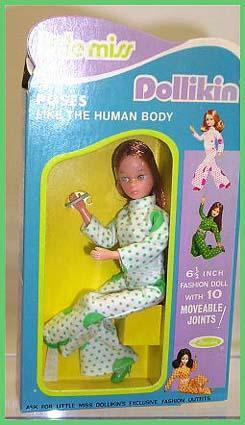 This doll was also sold as Triki Miki a Woolworth exclusive. Belle Doll & Toy Corp., Twixie the Twisting Pixie doll who has twelve joints.